Aug. 23, 2013 12:00 p.m. 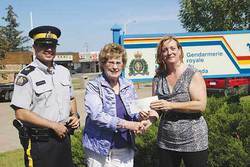 Guy Paurrealt, Victim Services RCMP liaison and Petra Pfeiffer Executive Director grateful to Sons of Norway. The Sons of Norway Lodge, Number 352, Normanna, was established in 1928 in the Wang District near Millet, Alberta. They met monthly at the Wang or Crooked Lake Hall and later at the Co-op Hall. Membership was open to individuals of Norwegian descent and their spouses who wished to preserve the traditions, language and culture and to meet together for fellowship and mutual assistance. Social activities tended to be dancing, singing, music playing, drama and picnics. During the investigation and court process, victims of crime can receive information from Victim Services about the investigation and protection orders; the criminal justice process, court, hearings, trials and dispositions; financial support and other sources of assistance within the community. Victims Services also assists victims by providing court orientation, court accompaniment and witness preparation and probation/parole information. Professor C. Sverre Norborg begins his fine history of Sons of Norway, An American Saga, with this descriptive paragraph: "The founders of Sons of Norway were Americans. They had crossed the wide Atlantic in search of greater opportunities for themselves and their families. From the day they passed through the immigration gates at Ellis Island, they knew that their lives and fortunes were linked forever with this vast and free land." This is the strong thread which runs through the Sons of Norway. To qualify for membership, one had to be male, either Norwegian or of Norwegian descent, give proof of being morally upright, in good health, capable of supporting a family, at least 20 years old and no more than 50. This first lodge changed its name to Nidaros Lodge l-001 when a second lodge was formed under the name Oslo Lodge 1-002. Quickly, others were formed around Minnesota so that by the end of the century there were 12 in all. When the membership was extended into Canada, the official name became the International Order of Sons of Norway. However, today the name is Sons of Norway making the Sons of Norway a world-wide organization with more than 400 local chapters servicing nearly 66,000 members. The purposes and goals of the Founding Fathers were to protect members of Sons of Norway and their families from the financial hardships experienced during times of sickness or death in the family. Over time, the mission of Sons of Norway was expanded to include the preservation of Norwegian heritage and culture in our Society. We have grown since our beginning and are now the largest Norwegian organization outside Norway. Today, Sons of Norway continues to make a conscious effort to build on the traditions of the past while at the same time focusing on the contemporary Norwegian-American lifestyles, thereby taking on a more modern look. There must be programs vital enough to appeal to the 4th and 5th generation descendants who show interest in their roots. Those original 18 members of "Sønner av Norge" would doubtless be surprised to see where their idea has gone since those first days in January, 1895, but one must feel confident that they would be proud to share in this modern philosophy of the fraternal organization they formed. The Sons of Norway Lodge, Number 352, Normanna, will continue to meet and will continue to preserve the Norwegian heritage and culture in this region. But, as each generation becomes more mobile and lifestyles and values change, the task becomes increasingly difficult.